"And when you see your men lie bleeding, dying at your feet, will you still be so stubborn? When your enemy sets Haeven afire and you hear the screams of defenseless women and children burning in their own homes, what will you do then, Eugene?" Gavril Nagarian is believed dead–perished in the heat of battle. But the Lord Drakhaon of Azhkendir lives on. Now he is entrusted with a sacred mission: to rescue the aged Magus, who has been kidnapped and in whose possession are the five priceless rubies that compose the fabled Tears of Artamon. Ancient law decrees that whoever possesses the coveted stones has the power to impose his rule over the five princedoms in the Empire of New Rossiya. But the task exacts a cost. The Drakhaoul that destroyed his forebears has penetrated Gavril’s psyche and is gaining power over his soul. With the dark forces inside him seeking immortality, Gavril must feed on the blood of innocents–or die. Toppled by the loss of the Tears of Artamon, Emperor Eugene of Tielen is tormented by his own daemon. Now he must defend his lands against King Enguerrand of Francia, who claims ownership of the Tears. But both men share a common goal: to destroy Gavril Nagarian and the Drakhaoul that lives within him once and for all. 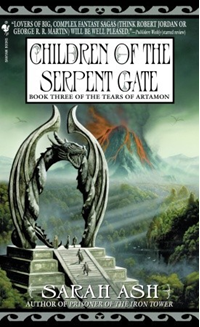 “Children of the Serpent Gate” is a spectacular, stunning conclusion to this wonderful series that has claimed a place in my top 5 best fantasy sagas. This has been such a powerful story and I’ve enjoyed every word of it. It’s a layered, complex and enthralling story that stays with you long after you’ve finished the last page. Kaspar Linnaius is a prisoner of the Commanderie in Francia, Gavril has just found Kiukiu but is about to lose here again, Kiukiu is struggling with the Drakhaoul’s Children’s cry for help from the Ways Beyond, Eugene is at the brink of war and Astasia is torn between her loyalty for Andrei and her love for Eugene. It’s a tale about love, loyalty, hope, bitterness and choosing between right and wrong. It’s about living with the choices you make and fighting for the things you believe in. Gavril embarks on an unexpected journey that takes us to another foreign country, with a resemblance to France. Gavril gets to meet new people, struggle with old temptations and gather information that will help him on his important mission. Because failing will come at a great cost, but to get to his goal, he has to sacrifice a lot of himself. I don’t want to give away too much about this final installment, because I’m a little scared of spoiling things for the people who have loved the first two books as much as I did. In the second book I began to feel sympathetic for Khezef, but I wasn’t sure if I was right about him. He’s still a daemon after all. In this book he totally won me over. I felt so sorry for him at some points. Great right? I’m actually feeling sorry for a daemon. And that reminds me of something one of my best friends said today (she’s kind of my soul mate ^^): there’s always something good and something bad in a person. Portraying someone as plain bad, or plain good isn’t realistic. There are two sides, we all have our good qualities and our bad ones. The truth about where the drakhaouls came from was really fascinating. I’m really glad we got to know them and their heritage a little better. To wrap it up: this is a must read for every true fantasy fan, especially those who love political intrigue and a darker side of fantasy. It has a lot of depth and kept me glued to the pages for many hours.